Dom Sebastian Gabriel of Bourbon and Braganza, (Rio de Janeiro, 4 November 1811 – Pau, 14 February 1875) Infante of Portugal and Spain, was an Iberian prince of the 19th century, progenitor of the Spanish ducal lines of Hernani, Ansola, Dúrcal and Marchena, and Carlist army commander in the First Carlist War. He was born in Rio de Janeiro in 1811 as the only child of Infanta Maria Teresa, Princess of Beira and Infante Pedro Carlos of Spain and Portugal. 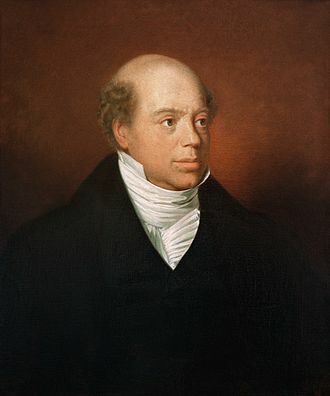 His mother was the eldest daughter of King John VI of Portugal (and also a granddaughter of King Charles IV of Spain); and his father, who died before Sebastian was born, was a male-line grandson of King Charles III of Spain, as well as a female-line grandson of the Queen regnant Maria I of Portugal and Brazil. Sebastian was soon granted the title of Infante of Portugal and Brazil. 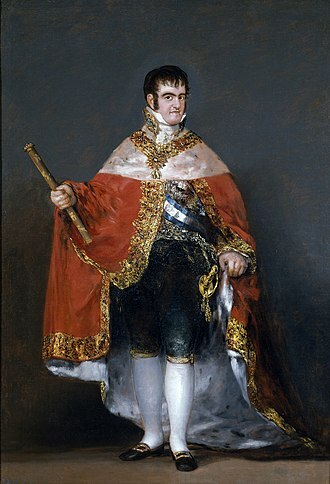 As he was only a great-grandson in the male line of a Spanish monarch, he was not a Spanish infante from birth, however in 1824 he was granted the style Infante of Spain by his maternal granduncle, Ferdinand VII of Spain. 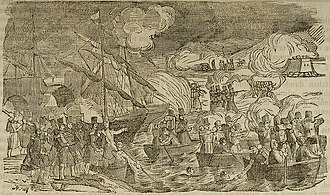 In Portugal, the country was in effective civil war since 1826, when "usurper-king" Miguel I of Portugal and his elder brother Pedro IV of Portugal (both were Sebastian's uncles) battled, until 1834. Sebastian's mother remarried two decades later, in 1838, her uncle, Don Carlos, Count of Molina, the first Carlist pretender of Spain. Teresa had been a Carlist supporter since the succession dispute started in 1833, and spent her time in the Carlist camp, usually in northern Spain. Sebastian participated in the second siege of Bilbao and became commander of the Carlist Army of the North from December 30, 1836. He won the Battle of Oriamendi (March 16, 1837) against the British Legion under George de Lacy Evans. Then he led the failed Royal Expedition against Madrid and was sacked upon its return to the north in late 1837. 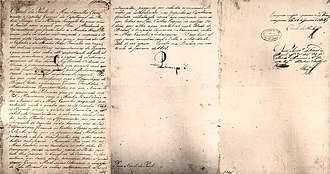 On January 15, 1837, during the First Carlist War, the then 23-year-old Sebastian was excluded, by law of the Cortes, ratified by royal decree of Queen Regent Maria Christina, from the Spanish succession, on the grounds that he had joined Don Carlos' rebellion against Isabella II of Spain. Sebastian was also declared to be stripped of his Spanish titles and status as a dynast. The same exclusion was legislated against Sebastian's mother and uncle, the deposed Miguel I of Portugal, as well as Don Carlos and his sons,. 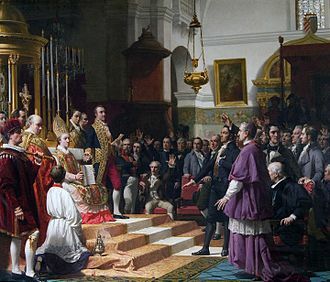 In 1859 Sebastian was restored to his Spanish titles, in conjunction with his second marriage. He returned to Spain from Naples where he had lived since the end of the war in 1839. 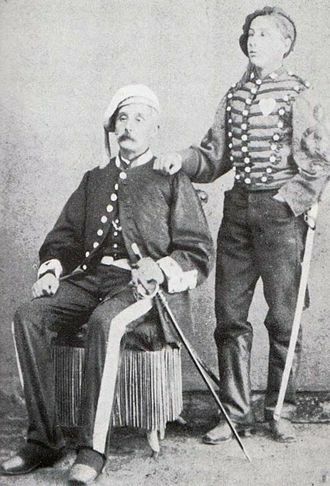 Sebastian first wed his cousin Princess Maria Amalia of Bourbon-Two Sicilies, but the marriage, which lasted several decades, remained childless. When widowed at the age of 50 he remarried, on 19 November 1860, his cousin Infanta Maria Cristina of Spain, the niece of his first wife, and two decades his junior. Their three sons, all Spanish dynasts until their marriages, were each granted dukedoms. Francisco, Duke of Marchena (Madrid, 1861 – Neuilly-sur-Seine, 1923), wed María del Pilar de Muguiro y Beruete, Duchess of Villafranca. Pedro de Alcántara, Duke of Dúrcal (Madrid, 1862 – Paris, 1892), wed María de la Caridad de Madán y Uriondo. Luis, Duke of Ansola (Madrid, 1864 – Algiers, 1889), wed María Ana Bernaldo de Quirós y Muñoz, Marquise of Atarfe. Don Alfonso de Borbón-Braganza y Borbón (Madrid, 1866 – Madrid, 1934). Don Gabriel de Borbón-Braganza y Borbón (Pau, 1869 – Madrid, 1889). The last head of one of these branches, the Duke of Hernani, adopted in the 1970s their distant cousin, Infanta Margarita of Spain, Duchess of Soria, who thus became the next and current Duchess of Hernani. After the overthrow of Isabella II of Spain in 1868 Sebastian moved to Pau, where he tried to reconcile the Carlist and Isabeline branches of the House of Bourbon, without success. 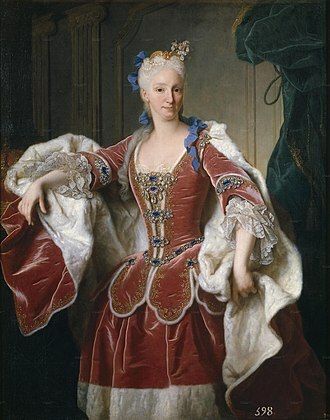 Elisabeth Farnese was Queen of Spain by marriage to King Philip V. She exerted great influence over Spains foreign policy and was the de facto ruler of Spain from 1714 until 1746, from 1759 until 1760, she governed as regent. Elisabeth was born at the Palazzo della Pilotta in Parma, daughter of Odoardo Farnese, Elisabeth would become the heiress of her fathers dominions after her uncle Francesco Farnese, Duke of Parma and his younger brother both remained childless. Elisabeth was raised in seclusion in an apartment in the Palace in Parma and she had a difficult relationship with her mother, but was reportedly deeply devoted to her uncle-stepfather. She was a student within dance, studied painting under Pierantonio Avanzini and enjoyed music. She survived a virulent attack of smallpox shortly after the War of the Spanish Succession and she was therefore made many marriage proposals. 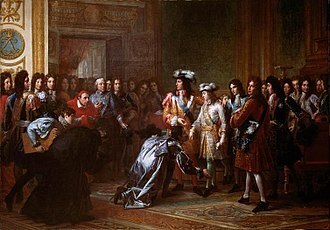 Victor Amadeus, Prince of Piedmont and Francesco dEste, Hereditary Prince of Modena both asked for her hand but negotiations failed, as well as Prince Pio della Mirandola. 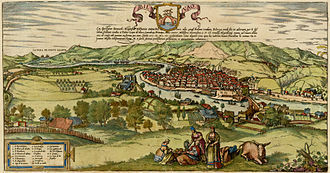 The Duchy of Parma would be inherited by her first son, after his accession to the Spanish throne, the title passed on to her third son, Infante Felipe. It was he who founded the modern day House of Bourbon-Parma, on 16 September 1714 she was married by proxy at Parma to Philip V of Spain. The marriage was arranged by the ambassador of Parma, Cardinal Alberoni, with the concurrence of the Princesse des Ursins, Elisabeth was a natural choice for Philip V because of the traditional Spanish interests in Italian provinces, as she was the heir of the Parmesan throne. 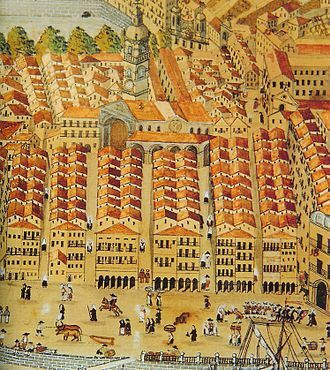 Elisabeth left Parma in September and traveled to Spain by land in a retinue led by Marquis Schotta, originally intended to travel by sea, she became ill in Genova, and the plans were therefore altered. On her way to Spain, she met the Prince of Monaco and the French ambassador, Elisabeth spent several days in Bayonne in November as guest of her maternal aunt, the Queen Dowager Maria Anna of Spain. At the Franco-Spanish border, she was met by Alberoni, who spent several days warning her against des Ursins, upon entrance to Spain, she refused to part with her Italian retinue in exchange with a Spanish one, as had originally been planned. Don Pedro Carlos was an Infante of Spain and Portugal. 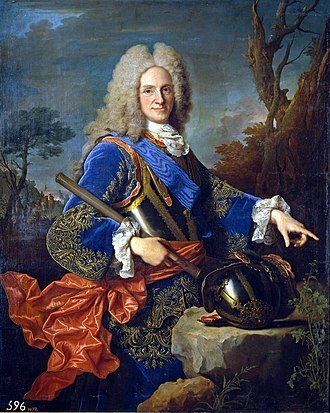 Infante Pedro Carlos was a son of Infante Gabriel of Spain and his paternal grandfather was King Charles III of Spain and his maternal grandfather was King Peter III of Portugal. Pedro Carlos was the surviving child of the couple and an orphan at the age of two. His father, an intelligent man, was King Charles IIIs favorite son. When King Charles III died the year, his successor Charles IV of Spain sent the child away to Portugal. In fact, Queen Maria I was worried about the Braganzas succession and Pedro Carlos was, in that moment, the child was raised there by his grandmother Maria I of Portugal. 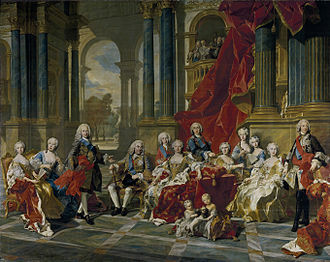 From this moment the prince became infante of Portugal. Pedro Carlos had inherited a fortune of his father and was welcomed in Portugal. 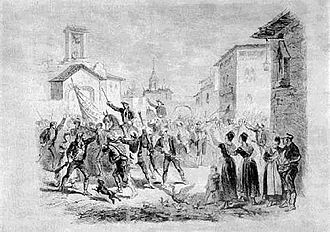 In 1792, his grandmother was officially declared insane and her son John, uncle of Pedro Carlos and they arrived in Salvador de Bahía on January 2,1808, and headed from there to Río de Janeiro, where the infante occupied the São Cristovão Palace. The Quinta da Boa Vista is a public park of great historical importance in the city of Rio de Janeiro, Brazil. The park was part of the gardens of the São Cristóvão Palace, the building of the old palace hosts now the National Museum, with collections on natural history and archaeology. The park is the home of the Zoological Garden of Rio de Janeiro, the Quinta da Boa Vista is located in the São Cristóvão neighbourhood, in the North zone of Rio de Janeiro. The Quinta da Boa Vista is a popular attraction for locals. The fact that the North zone of Rio de Janeiro, where the Quinta is located, has few public parks only contributes to its popularity. The main attractions are the park itself, with its areas, centenary trees and lakes, as well as the National Museum. Founded in 1818 by King John VI of Portugal, the National Museum was transferred to the old Imperial Palace of the Quinta in 1892. 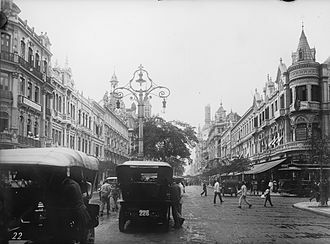 During its long history, its collections have been expanded by acquisitions and donations, including by Emperor Pedro II. The collections include Astronomy, Natural history and Archaeology, much of the art collection displayed by the Museum still consists of what was gathered by the Emperor Pedro II himself. In this manner, it reflects 19th-century views of Anthropology, additionally, as is the case with the building, the collection is poorly preserved. It reflects the lack of investment in education and sciences in Brazil and is in no way comparable to museums in the developed Western World. Visitors can see a few rooms of the ancient Palace with its original painted and stucco decoration, like the Throne Room, the Embassadors Room and these rooms still display a couple original pieces but are overall empty. The Zoo of Rio is perhaps the most popular attraction of the Quinta and it was inaugurated in 1945 under President Getúlio Vargas and is the oldest in Brazil. Among its over 2000 animals, the collections of Brazilian monkeys, centro de Arquitetura e Urbanismo do Rio de Janeiro. Guia da arquitetura colonial, neoclássica e romântica no Rio de Janeiro, Rio de Janeiro, Casa da Palavra. Elisabeth with her eldest son Charles. 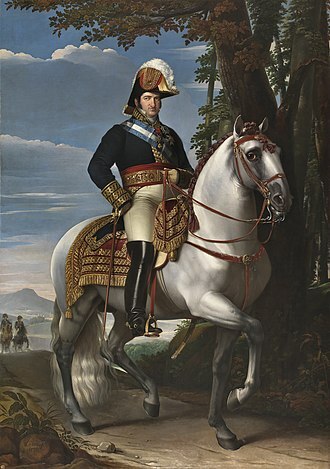 Maria Cristina's husband Sebastian of Portugal and Spain. Portrait by Nicolas-Antoine Taunay, 1817.